S.T.A.L.K.E.R. 2 is "officially" dead, but mutated post-Soviet hellholes will live on. Rumors of trouble with the development of S.T.A.L.K.E.R. 2 first came to light in December, when it was reported that the game was dead and the studio making it, GSC Game World, had been shuttered. Things got even muddier a month later when a studio rep announced that work on the game was actually ongoing, but the future of the game still seemed very uncertain and tenuous. 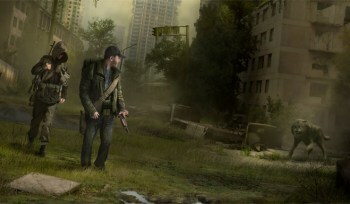 But now it appears official, as GSC Game World revealed via Twitter that S.T.A.L.K.E.R. 2 is "officially" dead. "Money was the issue," the studio tweeted. "We were not able to secure the rights to continue development of the S.T.A.L.K.E.R. series." But the news isn't all bad. In the wake of the S.T.A.L.K.E.R. 2 collapse, the team decided to stick together under the name Vostok Games and try its hand at something a little more expansive: Survarium, a free-to-play MMOFPS that unleashes the nightmare of the Zone on the entire world. The new game is built around the idea of a massive ecological disaster that strikes the Earth, leading to the collapse of nations, isolation of cities and the spread of anarchy across the world, while new, aggressive species of animals and plants begin to encroach on what's left of human civilization. "Technology versus nature, rational versus mystical. Such a confrontation enables us to take a new look at the current happenings in our world," said Lead Designer Aleksey Sytianov. "Survarium will offer players an atmospheric world of civilization crash, filled with factions and loners, stalkers and hunters surviving in a wild anomalous environment." It's incredibly disappointing that S.T.A.L.K.E.R. 2 is dead, but with the development team intact, maybe Survarium can recreate the horrible magic that made the S.T.A.L.K.E.R. games so compelling. An early look at Survarium can be had at its Facebook page and a video explaining some of the ideas for the game, and the reasons for the demise of S.T.A.L.K.E.R. 2, is up now on YouTube.